Marin, Switzerland, 4 November 2016 – EM Microelectronic, the semiconductor company of the Swatch Group, announces the EMBE01 enterprise grade Bluetooth v4.1 proximity beacon with extended battery life and a weatherproof enclosure for a variety of deployments in all conditions. The EMBE01 is part of the EM Microelectronic family of Bluetooth beacons, which includes the popular EMBC0x coin cell beacons. The EMBE01 is particularly suited for mass deployment by system integrators in demanding environments and for more permanent installations. 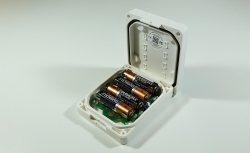 It is the first beacon in the line to include four AA batteries with 7-10 year lifetime, and an IP-65 rated weatherproof enclosure. The beacon includes a push button and magnetic reed switch for internal and external control, along with two LED’s for visual feedback to the user for simplified programming. Six common advertising standards are pre-programmed into the beacon including iBeacon™, altBeacon™, Eddystone™, and EM Sensor Beacon thereby allowing maximal flexibility of usage for customers. “The long battery life of the EMBE01 makes it perfect for deployments in shopping malls, museums and airports, for example, and the rugged enclosure opens up unique applications in stadiums, amusement parks, and ski-areas” says Michel Willemin, CEO of EM Microelectronic Marin. He adds, “This product builds on our strong offering of Bluetooth beacon products in addition to our market leading Bluetooth IC’s”. The EMBE01 can be delivered in any quantity with guaranteed unique ID numbers, and with a serial number and QR-code printed on the label for optical scanning. All beacon parameters including UID, output power, and beacon interval can be configured over-the-air, and the entire application firmware and stack can be replaced over-the-air if desired. The firmware can be customized using the Enterprise Beacon Development Kit. Complete source code and support is available through the emdeveloper.com forum for registered users. The EMBE01 is FCC, IC, and CE certified, RoHS, and REACH compliant. To know more about EMBE01 and other low-power offerings for smart connected solutions, visit EM at the Electronica 2016 Fair in Munich, Hall A4 Booth 206, or contact your local EM sales representative.